When shall their glory fade? A brief history of the Army Commandos (1939-1945) by Major James Dunning. The thirty-eight Battle Honours awarded to the Commando Association by Her Majesty the Queen in 1958 serve as an apt prologue to this short history of the five years of active service by the Commandos in World War II. Look at this formidable list and one notes it is not limited to any one theatre of war, but on the contrary the actions fought were world-wide, in-as-much as the Commandos fought with great distinction in Norway, France, Belgium, Holland, Germany, Sicily, Italy, Yugoslavia, Greece, the Adriatic Islands in North Africa, Crete, Syria, Eritrea, Abyssinia, Madagascar and even further afield in Burma. Furthermore, it should be emphasised that the operations and campaigns mentioned as Battle Honours recognise only those deemed to be really outstanding feats of arms. As such they represent only a fraction of the raids and battles fought by Commandos in those five years. For example, many of the daring raids carried out by the specialist Commando units and groups on the enemy-held coastline of North-West Europe prior to D Day are covered by the single Battle Honour of “North-West Europe 1942-44”; by the same token many of the operations carried out in the Middle East by the Commandos formed out there and also those sent out there from Britain (‘Layforce’) are covered by the single Honour, “North Africa 1941-43”. In addition, the many decorations, British and foreign, awarded to the officers and men of the Commandos also provide an impressive record of individual bravery and courage in action. In his early ‘Short History of the Commandos’, Brigadier Peter Young, himself an outstanding Commando leader and prominent post-war military historian, provided the following totals: eight Victoria Crosses, thirty seven Distinguished Service Orders (DSO), with nine bars, one hundred and sixty two Military Crosses (MC) with thirteen bars, thirty two Distinguished Conduct Medals (DCM) and no fewer than two hundred and eighteen Military Medals (MM). There were, as mentioned earlier, additional foreign decorations including the Legion d’Honneur and the Croix de Guerre. But one should also remember – and acknowledge – that there were many acts of bravery that went unrewarded too. So much for the historic legacies that bear testimony to the deeds of those who served in the Commandos, but when, why and how was this unique force raised (for no such specialised military forces existed in the British Army before World War II) and what type of men volunteered to serve in them? It was in the dark days of 1940 when Britain’s fortunes, following the fall of France and the evacuation from Dunkirk, were at their lowest ebb that the formation of the Commandos began. At the time the Nazis occupied practically all of North West Europe and with their Fascist ally, Italy, threatened the Balkans and the Middle East. With command of the coastline from the Arctic to almost the Pyrenees, the enemy stood poised and prepared to invade these Islands. The threat of invasion was real and completely dominated the thoughts and daily lives of all. They were grim days. Yet in spite of the urgent need to concentrate on defence the Prime Minister, Winston Churchill, was not content to rely on just passive defensive measures. He boldly advocated some form of limited offensive action against the enemy’s extended and vulnerable coastline of Europe. So, with this in mind, he advocated the raising of a special service force. He suggested that, in the short term, and raised immediately, they would be available to “spring at the throat” of any enemy seaborne or parachute landings. These Special Service troops (or ‘Commandos’ as they ultimately became known) would carry out a campaign of ‘hit-and-run’ raids on the enemy-held coastlines and thereby create ‘a reign of terror’ on the enemy prior to the eventual invasion and liberation – for even in those dark days Churchill was confident of ultimate victory. It must be said here that there were already in existence some other volunteer forces raised for special service, namely the ‘Independent Companies’ and some of them had been engaged on the ill-fated campaign in Norway. Nevertheless when these Independent Companies were subsequently disbanded many of the officers and men volunteered for the Commandos, including such distinguished leaders as Brigadier Tod and Colonels Newman, VC, and Trevor. In the event Commandos were formed from late June onwards and a party from one of the newly formed Commandos, No. 3, together with another party from No. 11 Independent Company , carried out a raid on the Channel Island of Guernsey on 5th July 1940. Unfortunately, for several reasons, it was a dismal failure, but it did provide important lessons, which were acted upon. Going back a step, it is generally accepted that Lieut. Colonel Dudley Clarke was the staff officer responsible for organising the formation of the Commandos on the lines of Churchill’s original directive, which among other things recommended that the personnel of this new force should be drawn from all branches of the Army and, importantly, that they would all be volunteers picked by the officers who were to be their leaders into action. This element of picked volunteers remained a fundamental principle of the Commandos throughout the War. Another basic characteristic of the Army Commandos was the regime known as ‘RTU’, standing for ‘Return to Unit’. Briefly it meant that anyone – officer or other rank – who for any reason whatsoever failed to measure up to the standards of discipline, training or conduct expected, or laid down by the Commanding Officer, would be sent back to his parent unit. In the course of the next five years not a few were . . . Subsequently, during the summer of 1940, whilst Britain was increasingly under the threat of invasion and air attacks, recruiting for the Commandos went ahead with the aim to raise a total of twelve Commandos, one of which, the original No. 2 Parachute Commando, was earmarked to carry out airborne operations. However the full number was not initially raised; for example the raising of No. 10 did not materialise until 1942 when it was decided to raise an Inter-Allied commando, consisting of volunteers from our Allies, including French, Dutch, Belgian, Norwegian, Polish, Yugo-Slav and – oddly enough – Germans, and as the title of No. 10 was still vacant it became the obvious choice. One must also add that by the end of 1940 No. 2 (Para) Commando had become known as No. 11 Special Air Service Battalion and in the next year after a daring airborne raid on a target in Italy it became the 1st Bn The Parachute Regiment. In the meanwhile, a new No. 2 Commando had been formed with volunteers from the Independent Companies. A further unique feature of the Commando organisation was the fact that they were not stationed in barracks. Instead they were supplied with a ration card and a subsistence allowance and made responsible for their own accommodation and feeding, with ‘Civvy Billets’ providing the ideal and successful outcome. Such is a brief background of why, when and how the first Army Commandos were formed. Later eight Royal Marine Commandos were raised, as were other specialised units including training centres and a holding unit, and mention of these is to follow. At first each Commando consisted of ten Troops of fifty all ranks, but this organisation was found to be unwieldy and was subsequently altered, in early 1941, to six Troops of sixty-five. Later after the experiences in North Africa, where the Commandos had to hold ground ‘in the line’ but lacked the normal heavier infantry weapons, such as 3-inch mortars and Vickers’ medium machine guns, a Support Troop – with these weapons- was introduced as was a MT (motor transport) Troop. Whilst the first Commandos were being formed in the United Kingdom three Commandos were raised in the Middle East. Their organisation was different, and furthermore they recruited Palestinians – both Arab and Jews – and some Spanish veterans of the Civil War in addition to volunteers from the British Army stationed out there. They carried out some operations on the enemy-held coastline of North Africa and also on a target in the Mediterranean, but the outcomes were disappointing. However, from December 1940 No. 51 Commando was in action in Eritrea and Abyssinia, where they made a substantial contribution to the victory and liberation of those two Italian-held countries. During the winter of 1940 the original concept of the Commandos being mainly employed on small scale ‘tip and run’ raids was being amended, in-as-much as the Director of Combined Operations, Admiral Sir Roger Keyes, with the approval and support of the Prime Minister, Churchill, began to visualise and plan for larger scale operations. Indeed it was to this end that the main training on the Isle of Arran was focussed and ultimately led to the dispatch of ‘Layforce’ to the Middle East. Nevertheless, in spite of this development the original concept was maintained through the newly created Special Boat Section (SBS) and later the Small Scale Raiding Force (SSRF, later given the cover title of No. 62 Commando) and later still special small raiding parties for specific operations organised from personnel within a Commando. The first big major raid was the combined Nos. 3 and 4 Commandos’ raid on the Lofoten Islands on 4th March 1941. Taking the enemy completely by surprise, they struck a significant blow at the German war economy without loss to themselves. The tally of achievements was spectacular: the destruction of eleven fish oil factories processing cod oil for use in the manufacture of high explosives and other uses, together with the stock of oil, ten German and German-used ships were sunk, 215 German POW’s were brought back, and equally important, although not reported at the time, a vital piece of equipment of the enemy ‘Enigma’ system for the researchers at Bletchley. This successful raid was also a welcome fillip to home morale at the time of the ‘Blitz’. Later Nos. 6 and 12 Commandos carried out further raids on Norway, but undoubtedly the most important and successful of these raids was the one on Vaagso on 27th December 1941. Supported by Hampden bombers and destroyers of the Royal Navy, the raiding force consisted of No. 3 plus a strong detachment from No. 2 Commando. After bitter fighting the Commandos destroyed the occupying German garrison, a coastal defence battery, several fish factories and 18,000 tons of enemy shipping. In addition, they brought back 98 prisoners plus valuable intelligence material. But this success came at a price – twenty Commandos killed and fifty-seven wounded in the fierce street fighting. During February 1942 the first Royal Marine Commando was formed and originally called ‘A’ (RM) Commando, but later designated ‘No. 40 RM Commando’. In October of that same year a second RM Commando, No. 41, was formed and by the time of D-Day 1944 there were eight RM Commandos in action alongside the Army Commandos. Next came the greatest and most daring of the entire Commando raids, namely that on St. Nazaire on 28th March 1942. Under the command of Lieut. Colonel A. C. Newman, the raiding force consisted of all of No. 2 Commando plus demolition parties from Nos. 1, 3, 4, 5, 9 and 12 Commandos. Such was the importance and scale of this operation that whole books have been devoted to this single Commando raid. Suffice it to add here that the main object of the raid was to put out of action the huge dry dock of St Nazaire, the largest in the world, and thus deny its use to the German navy in the crucial on-going Battle of the Atlantic. There were also additional objectives for the raiders that included the demolition of ancillary dockyard installations. In this action, which was successful, but costly in casualties, many brave deeds were carried out and heading the list of awards were two Victoria Crosses, one to Colonel Newman, the other, posthumously, to Sgt Durrant. In May 1942 No. 5 Commando was in the vanguard of the invasion of Madagascar, an operation designed to thwart the enemy of the use of naval bases in the Indian Ocean and threatening our sea routes to the Far East. In a daring unsupported night landing, before the main assault, No. 5 neutralised two coastal batteries and captured some 300 prisoners with only light casualties to themselves. They followed up this success with actions that resulted in the capture of Diego Suarez and the seizure of both Tamatave and Tananrive, and finally a section of one Troop took part in an action mounted on requisitioned horses – reminiscent of the original Commandos of the Boer War, only then the Boer Commandos were fighting the British! On 19th August 1942, two Army Commandos (Nos. 3 and 4) and one RM Commando (No. 40) took part in the controversial Dieppe Raid. In support of the main Canadian assault force, the tasks of Nos. 3 and 4 were to destroy the enemy coastal batteries covering the main landing beaches, whilst No. 40 had selected tasks in the port area and was to be responsible for reinforcements as required. In the pre-dawn run-in the landing craft of No. 3 were fired upon and scattered with the result that only two small parties managed to land, one was overwhelmed, but the other successfully engaged the Berneval battery for some hours before withdrawing. On the other flank at Varengeville No. 4, under the command of Lord Lovat, carried out what was officially hailed as a ‘classic operation of war’ and completely destroyed the Hess Battery, successfully withdrawing and re-embarking with prisoners. In this action, Capt Pat Porteous of No. 4 won the Victoria Cross. Unfortunately, No. 40, when committed to their landing, under well-nigh impossible conditions, suffered severe casualties including the loss of their CO, Lieut. Col. Phillips. On the credit side of this overall costly operation, important lessons were learnt on the problems of large-scale combined operations and these were heeded and acted upon, particularly in the forward planning of Operation ‘Overlord’. In November 1942, Nos. 1 and 6 Commandos were in action in the Allied landings (operation ‘Torch’) in North Africa and subsequently served throughout the Tunisian campaign as part of the field force – a role they were neither armed nor equipped to carry out as they lacked not only transport but the normal heavy infantry weapons at that time. Yet in spite of these shortcomings they fulfilled their commitments with distinction “from Fort Duperre in Algiers to the White House at Douar, the Green Gill near Sedjenane and the green plain of Goubellat” proving that, although originally organised and trained for seaborne raiding, they could turn their hands to anything asked of them. They returned to England as seasoned campaigners and each in possession of a letter of gratitude from General Eisenhower. About this time, following the establishment of the Commando Basic Training Centre at Achnacarry, a further Commando training centre was set up at Braemar in the Cairngorm mountains of Scotland for the purpose of specialised training in mountain warfare, initially christened the Commando Mountain Warfare Training Centre (CMWTC). The instructors included a whole range of experienced mountaineers, including Major John Hunt, who later organised and led the first successful ascent of Mount Everest. Later CMWTC moved to St Ives in Cornwall to instruct two RM Commandos in cliff-climbing techniques for their proposed roles on D Day. Thereafter, the unit in addition to training cliff climbers also became the centre for the planning, training and experimenting for small boat and canoe raiding, and in this role several of the instructors took part in the operations at Walcheren and the crossing of the Rhine. Back in the Mediterranean in July 1943, Nos. 3, 41(RM) and 43(RM) Commandos were in the forefront of the landings on Sicily – the stepping-stone to the invasion of Italy. Thereafter, destroying an Italian battery covering the beaches at Cassibile, No. 3, at very short notice, followed up by capturing a vital bridge near Agnone. A week before the subsequent invasion of Italy some 60 men of No. 3, under the command of Major Peter Young, landed on the ‘toe’ of the mainland to carry out raids and reconnoitre the coast defences prior to the main landings – these actions gave rise to the claim of this Commando that they were the first British troops to gain a foothold – and stay – on the continent of Europe after Dunkirk! The next main action of the Commandos in Italy was at Salerno in September when Nos. 2 and 41 RM were engaged in bitter fighting suffering heavy casualties, but they did have notable successes. On one occasion, in a triumphant night attack, No. 2 took 136 German prisoners, which at the time was more than the whole Division, to which they were attached, had taken. 1 Special Service Brigade (later 1 Commando Brigade): consisting of Nos. 3, 4(*), 6, 45 and 46(*) RM Commandos for operations in North-West Europe. 2 Special Service Brigade (later 2 Commando Brigade): consisting of Nos. 2, 9, 40 RM, 41 RM(*) and 43 RM Commandos for operations in Italy, the Adriatic, Albania and Greece. 3 Special Service Brigade (later 3 Commando Brigade): consisting of Nos. 1, 5, 42 RM and 44 RM Commandos for operations in the Far East. 4 Special Service Brigade (later 4 Commando Brigade): consisting of Nos. 41 RM, 46(*), 47, 48 and No. 4(*) Commandos for operations in North-West Europe. In addition to the above it must be pointed out that detachments from No. 10 (Inter-Allied) Commando operated within all these Brigades, and also prior to D Day provided parties for small scale reconnaissance raids on the coasts of North-West Europe, thus supplementing those carried out by the SBS. In the spring of 1944 both 1 and 4 SS Brigades began preparing for their respective roles in the invasion of Normandy, launched on 6th June with 1 SS Bde, under the command of 6th Airborne Division, landing on ‘Sword’ beach with the tasks of capturing the port of Ouistreham and then linking up with the ‘Red Devils’ to secure the vital bridge over the Orne and the left ferry flank of the Allied invasion. The Royal Marine Commandos of 4 SS Bde landed to the west of their Army comrades under the command of different Canadian and British divisions on three separate beaches, namely, ‘Sword’, ‘Juno’ and ‘Gold’. No. 4 Commando, with two full Troops of French Commandos under command, succeeded in capturing Ouistreham with great dash and élan, whilst the rest of that Brigade fought their way inland to link up with the airborne forces beyond Pegasus Bridge. Throughout the days – and weeks – that followed the two Commando Brigades fought ‘in the line’ defending the Amfreville heights and the left flank of the invasion bridgehead, for, after completing their initial tasks to the west from the three beaches mentioned above, 4 SS Bde had regrouped and moved over the Orne to the left flank too. During the ensuing period of protracted defence of this salient position, the subsequent break out and pursuit of the enemy towards the river Seine, lasting no less than 83 days of continuous action, 1 SS Bde was commanded by Lord Lovat until he was seriously wounded on 12th June, when Brigadier Mills-Roberts took over, whilst 4 SS Bde was commanded throughout by Brigadier ‘Jumbo’ Leicester. Their respective battles and their parts in the liberation of French towns and villages are well marked today with memorials, mostly erected by the local citizens who still annually remember and commemorate their liberation by the Commandos. Suffice it to add that the casualties suffered by the two Brigades over the period 6th June to 30th September were high, with well over 50% of their overall numbers either killed, seriously wounded or missing. However, they were sustained by a steady trickle of reinforcements from the Holding Operational Commando (HOC) established in late1943 at Wrexham, where fledgling Commandos, after their initial training at Achnacarry, were posted to undergo further training before drafting to an operational Commando. However, in spite of these arrangements it was necessary to bring 1 SS Bde back to England for reorganising and re-equipping. Meanwhile 4 SS Bde having been placed under the command of 1 Corps was involved in further operations in the liberation of France, including the crossing of the Seine, at Dunkirk and in the port of Le Havre. Returning to the Mediterranean theatre of war, 2 SS Bde (firstly under the command of Brigadier T Churchill and later under Brigadier R Tod) was kept fully occupied from late 1943 onwards in a series of widely spread operations in Italy, the Adriatic Islands and the Balkans. In December, No. 9 was in action on the lower reaches of the Garigliano, then these operations were followed by the Anzio landing involving both No. 9 and 43 RM Commandos. Initially they encountered light opposition, but a few days later it was a different story when their objective was the enemy positions on Mount Ornito and although they succeeded, No. 9, in particular, suffered heavy casualties. Meanwhile to the east of mainland Italy No. 2 Commando, under the command of Lieut. Colonel ‘Mad Jack’ Churchill, was operating in the Adriatic, off the Dalmatian coast, where Churchill had established his HQ on the island of Vis. There his force was strengthened with the addition of not only 43 RM Commando, but also a number of Yugo-Slav partisans. From Vis, Churchill carried out a series of raids on nearby islands, occupied by the Germans, with notable successful raids on Solta and Hvar but these successes received a serious set-back when a full scale assault on the island of Brac by No. 2 and 43 RM Commands, supported by the Heavy Weapons Troop of 40 RM Commando, resulted in substantial losses that included Lieut. Colonel ‘Pops’ Manners (40 RM) killed and the capture of Colonel Jack Churchill – who awaiting the German counter-attack played his bagpipes in defiance! Later Nos. 2 and 43 Commandos were operational in, and from, Albania, whilst No. 9 was in action in Greece for nearly five months in operations that extended from Athens (where the Commando took part in the liberation parade and Colonel Todd received the Freedom of the City) to Salonika in the north, whilst No. 43 fought in Yugoslavia from Dubrovnik. Eventually all of 2 SS Bde were recalled to the mainland of Italy to assist the 8th Army in the final stages of that campaign. So it was that on 1st April 1945 a force of the Brigade (Nos. 2, 9, 40 and 43 Commandos) plus some specialist units including the SBS and an armoured regiment, all under the command of the recently promoted Brigadier Tod, took part in the crucial but complicated amphibious operation in this final major offensive. Briefly, their task was to secure the spit of land between Lake Comacchio and the sea and in so doing tie the enemy down while the main Allied force assaulted through the Argenta Gap. The conditions under which the Commandos had to operate were atrocious as they struggled across Lake Comacchio. Weeks of drought had lowered the water and so for hours they had to heave and drag their assault boats through the stinking and glutinous mud. Despite the inevitable confusions and delay imposed by these conditions, the outcome was a marked success, but not without cost. Many brave deeds were performed and two Victoria Crosses were awarded to Commandos. One to Corporal T. Hunter of 43 RM Commando and the other to Major A. Lassen, a Dane serving in the SBS. Both were posthumous awards. Going back in time and to the campaign in North West Europe, the next major operation involving the Commandos, after the break out from Normandy, was the amphibious assault on the island of Walcheren, off the coast of Holland, the capture of which was essential to the opening up of Antwerp as the major Allied supply port for the final push into Germany. The major role for the assault landings was allotted to 4 SS Bde, which had previously consisted of four RM Commandos but for this operation No. 4 (Army), whose task was to capture the port of Flushing, replaced 46 RM Commando. The three RM Commandos, with detachments from the Belgian and Norwegian Commandos from No. 10, were to land in the Westkapelle area, and had a range of sophisticated armoured amphibious vehicles in addition to the conventional landing craft. No. 4 Commando, after a daring pre-dawn landing and nearly two days of bitter street fighting, succeeded in capturing the port and most of the town before being relieved by the 52nd Infantry Division. They were thus enabled to rejoin the rest of the Brigade, who without air or artillery support, had made a daylight assault landing at Westkapelle, in the face of heavy enemy fire from the formidable gun emplacements built into the sand dune dykes. For three days, without any room for manoeuvre due to the deliberate flooding of the island by the Germans, the RM Commandos frontally attacked and, one by one, captured the heavily defended strong points sited along the crest of the dykes, before successfully linking up with their comrades of No. 4 who had advanced from Flushing. After eight days of continuous action, the whole island was captured and the enemy surrendered with many prisoners. Although during that time the Bde suffered a total of almost five hundred casualties they had the satisfaction of knowing that the port of Antwerp was opened and supplies were being offloaded by the end of the month. In December 1944, the Special Service Group and its four SS Brigades were all renamed to become Commando Group and Brigade, but the allotted numbers of the Commandos remained the same. About the same time there were plans to send 1 Cdo Bde to the Far East in the New Year, but due to the German counter offensive in the Ardennes over the New Year and in January, plus the appreciation that the Commandos could provide invaluable support in the foreseen river crossings in the eventual push into Germany, the plans for the move to the Far East were cancelled and instead the Brigade returned to Europe. On arrival its first task was to hold a stretch of the river Maas, and it was during this period of operations that Lance Corporal H. Harden, a medical orderly of the RAMC, with 45 RM Commando, won the Victoria Cross. Subsequently, the Brigade’s next large-scale operation was the crossing of the river Rhine at Wesel. Intensive training and detailed planning were the keys to the remarkable success of this Commando operation on 23rd March, which incurred less than 100 casualties. The next water obstacle to be tackled by the Brigade was the river Weser, where it was employed to reinforce and exploit a small bridgehead already established. This operation was followed by the passage of the river Aller, which resulted in some heavy fighting in the woods beyond. A serious situation was averted by a spirited counter attack by No. 6: “the hunting horns sounded and led by Lieut. Colonel A. C. Lewis, the Commando charged forward through the trees at a fast double and with bayonets fixed” – possibly one of the last bayonet charges of the War. By 19th April, 1 Cdo Bde had reached Lunenburg and prepared for its final operation, the crossing of the Elbe and the subsequent advance to Neustadt, where on 4th May, Brigadier Mills-Roberts took the surrender of Field Marshal Milch with all of the German troops under his command. It was a fitting climax to the Brigade’s trail of successes, which it had blazed over the previous six weeks. With it came the end of the War in Europe and ‘VE Day’. But in the Far East the conflict was far from finished. There 3 Cdo Bde under the command of Brigadier Campbell Hardy – he later became Commandant General of the Royal Marines and a staunch Patron of the Commando Association – had to wait until January 1945 before seeing action, but when its turn came it responded nobly to fighting of a ferocity that appalled even the most seasoned and hardy veterans. The Bde first occupied Akyab and followed this with a three-day battle for Myebon, where it destroyed a Japanese cavalry regiment before pushing up the Daingbon Chaung in LCA’s in a bold tactic to take up positions astride the enemy’s communications at Kangaw. The Japanese counter attacked with relentless determination (31st January), attacking en masse and enduring huge casualties in a way utterly strange to those soldiers accustomed to the more modern methods of European warfare. The battle raged all day. In the end, the vital feature, Hill 170, remained firmly in Commando hands, but the total casualties of the Commandos killed and wounded were 134 all ranks, of which nearly half were from No. 1 Commando; in contrast the Japanese lost about 450 men in their final attack. Kangaw has been the decisive battle of the whole Akyab campaign and that it has been won was largely due to your magnificent courage on Hill 170”. 3 Cdo Bde was subsequently earmarked for operation ‘Zipper’, the invasion and liberation of Malaya, but this was pre-empted by the dropping of the atom bombs and the Japanese acceptance of the Allies’ surrender terms on 14th August. With it came the end of the Commandos’ fighting in World War II, although they all had occupational duties in their respective theatres of War. It has been impossible in such an abridged narrative as this to do justice to the countless actions fought by the Commandos. Furthermore, scant mention has been made of the many small, but important, raids and actions of the ‘offshoots’ of the major Commando units. Reference has been made of the SBS, but there were others including the short-lived Nos. 14, 30 and 62 Commandos. Readers must seek elsewhere to learn of their exploits. 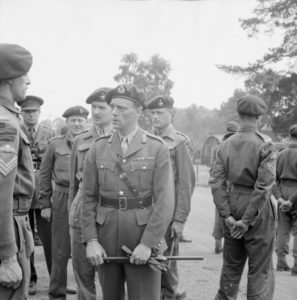 Major-General Sir Robert Laycock, inspecting Royal Marines Commandos. On 25th October 1945 the final chapter of the Commandos of World War II was written with the announcement by Major General ‘Bob’ Laycock, who had been one of the original volunteers for the Commandos in 1940 and had subsequently been promoted to succeed Lord Louis Mountbatten as Chief of Combined Operations, that his beloved green bereted Commandos were to be disbanded. Full of obvious remorse of the demise of such a splendid fighting force, the General added that the green beret would also die with the disbandment. It did for a while, but a short time after the War, thanks to the resolve of Lord Louis, it was reintroduced as the headdress of the post-war Royal Marine Commandos. Surely there can be no finer tribute to the Commandos of World War II than the acknowledgement, worldwide, that this distinctive headdress is still recognised and accepted as the hallmark of an elite fighting force. Indeed, looking back after a lapse of some sixty years it is gratifying to see that those five years of service, courage and sacrifice outlined here set standards and a tradition for others to follow and that the Commando idea, spirit and heritage has been kept alive and fostered by successive generations of young men in the Royal Marine Commandos following in the footsteps of all those who served between 1940 and 1945. No history of the Commandos in World War II, no matter how brief, is complete without some details of ‘Achnacarry’, as the Commando Basic Training Centre, is best known – and remembered. Initially all volunteers for the Commandos received their specialist training within their individual Commandos, but this became increasingly unsatisfactory as the need for fully trained replacements became crucial. Accordingly in 1942 a training centre, able to provide a steady flow of reinforcements trained to the high Commando standards, was set up in hutted camp based on Achnacarry Castle in the Western Highlands of Scotland, to meet this need. Located on the banks of the river Arkaig in the heart of Lochaber, near Spean Bridge, this historic seat of the Chief of the Cameron Clan, was ideally sited for the rugged and realistic training. Fortunately, already serving in the Commandos was the right man to take command of the new centre, namely Lieut. Colonel Charles Vaughan, OBE, a formidable old veteran of World War I. He recruited a splendid and devoted staff of instructors with the result that ‘Achnacarry’ quickly became a byword for the most strenuous ‘Battle School’ of the Allied Forces. Indeed it became the model for such training elsewhere, whilst ‘Commando Training’ became a new military term with a universal understanding of its meaning and implications. Following the establishment of Achnacarry no volunteer could join a Commando unit or wear the coveted green beret without passing the six-week course. Training was carried out in accordance with a laid-down and structured syllabus, and the programme had to be followed regardless of adverse weather conditions, because Vaughan argued there would be times on active service when Commandos would want to use such factors as poor weather or hostile terrain as an ally to achieve surprise – an important principle in operational success. Obviously, physical fitness was one of the first aims, and a series of progressive and infamous ‘Speed Marches’, starting with 5 miles and working up to 15 miles in set times and in ‘battle order’ i.e. carrying weapons, ammunition and full equipment, and always concluding with the assault/obstacle course or a firing practice played a prominent part. High priority was placed on the skilled handling and firing of all weapons, British, Allied and even captured enemy weapons. Field-craft, the art of moving across all types of terrain; unseen and unheard at night, in the age-old manner of the hunter/poacher was also a basic subject. The remoteness of the location afforded opportunities for unlimited, but strictly controlled, ‘field firing’ using live ammunition and explosives, thus adding realism to the training plus a ‘baptism of fire’. The list of subjects on the training programme was lengthy, but none was so novel to the British Army in those days as the introduction of ‘unarmed combat’. As its name implies it taught not only how to defend and attack an enemy when unarmed, but equally important it imbued that extra fighting spirit that expressed itself whenever the Commandos went into action. 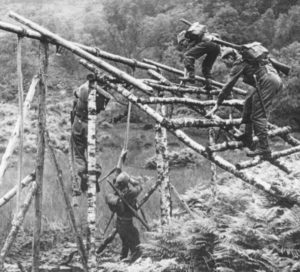 Another unique feature of the Achnacarry course was the introduction of the ‘Me and My Pal’ principle, whereby every new Commando trainee teamed up with another; together they faced the course and its rigours as a team, albeit a team of two. Many of these friendships forged at Achnacarry even continued after the War. So after six weeks, wearing their green berets presented on the final day of the course, the fledgling Commandos marched away from Achnacarry on the six miles to the Spean Bridge railway station to travel to the Holding Commando at Wrexham prior to being posted to an operational Commando and action overseas. Some never returned to these islands, however, they, in particular, are remembered by the magnificent Commando memorial purposely sited in the heart of the Achnacarry training area. A total of nearly four hundred decorations were awarded to officers and men of the Commandos for bravery and devotion in action, but pride of place must surely go to the eight Commandos who were awarded the Victoria Cross. The following brief descriptions, taken from their original citations, clearly emphasise the worldwide involvement of the Commandos in World War II. Sadly, six of the eight Commando VC’s were posthumous awards. LtCol. Geoffrey Keyes, was an original volunteer and commanded a Troop in No. 11 (Scottish) Commando, which became part of ‘Layforce’ sent to the Middle East in 1941. After several operations in that theatre, including an operation in Syria where he was awarded the Military Cross and the Croix de Guerre, he took over command after the CO had been killed and subsequently led the daring raid described below. Col Keyes, VC, MC, was buried in the Benghazi War Cemetery, Libya. He is also remembered on memorial tablets dedicated to his father, Admiral of the Fleet Lord Roger Keyes, first Chief of Combined Operations, in Westminster Abbey and in St James’ church, Dover. Colonel Newman survived captivity and after the War was a staunch supporter of the Association and also served as President. Sgt Durrant, VC, was buried in Escoblac-la-Baule War Cemetery in France. Capt. Patrick Porteous, was a Troop leader in No. 4 Commando, but because Lord Lovat had to cut down the number of troops taken on the Dieppe raid, most of his Troop were ‘left out of battle’, but he, with a small detachment, had the task of acting as the liaison officer between the two assault Troops chosen to assault and destroy the enemy coastal battery. “On 19th August 1942 at Dieppe, France, during the initial assault (on the battery) Capt. Porteous was shot through the hand, but nevertheless disarmed and killed his assailant, thereby also saving the life of a Sergeant (in his detachment). Later after the War Capt. Porteous was promoted to Colonel, and was a staunch supporter of the Association also serving as President. Lance-Corporal Henry Harden, Royal Army Medial Corps, was with 45 (RM) Commando in the North-West Europe campaign. Lance-Corporal Harden, VC, was buried in the Nederweert War Cemetery, Holland, and his deeds are remembered on a plaque on the bridge over the Montforter at Bracherbeek. Lieutenant George Knowland, originally in No. 3 Commando and having distinguished himself, as a Sergeant, in action in Sicily was commissioned and posted to No. 1 Commando, which was part of 3 Commando Brigade in Burma, where they were heavily involved in the crucial battle of Kangaw. Lieutenant Knowland, VC, was buried in the Taukkyan War Cemetery, Burma. “On 2nd April 1945 at Lake Comacchio, Italy, Corporal Hunter, who was in charge of a Bren gun section, offered himself as a target to save his Troop. Seizing the Bren gun he charged alone across 200 yards of open ground under intense fire towards a group of houses where three Spandau machine guns were lodged. Corporal Hunter, VC, was buried in the Argenta Gap War Cemetery, Italy. Major A. Lassen, VC, MC and two bars, was buried in the same cemetery as his fellow VC Commando, Corporal Hunter, VC, namely in the Argenta Gap War Cemetery. There is a stone memorial to Major Lassen outside St Peter’s church at Praesto Fjord, Norway, whilst a forest has been named after him in Israel; he is the only non-British/Commonwealth national to have been awarded the Victoria Cross, which makes it unique.